What is more hilarious than seeing a wrestling superstars with magical power, fantasy name and uniforms? 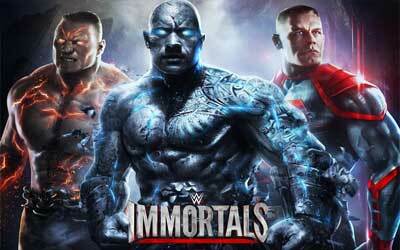 WWE Immortals APK 2.1 comes as an interesting wrestling games that are still rare in mobile platform. The game is developed by Warner Bros. International. The game requires player to create a team consist of three wrestling superstars. Characters are split into several cards of level; bronze, silver and gold with gold being the strongest and powerful character. The main goal is to collect as many cards as possible. WWE Immortals is basically free, but to boost up the superstar, the game is built in app-purchase with cash to pay some additional features. The looks of the characters mostly are similar with the real WWE superstars counterpart, but as the name suggests, the developer adds some ‘magic’ by making them more dreamy and looks like coming from fantasy land with ridiculously hilarious looks and superpower. The game is mostly about fight and battles. After choosing three WWE superstars as team players, they can beat the enemy by tap on it or by swiping into certain direction. The power-ups help the character to use more powerful attack until the enemy is defeated. There are special attacks that bring twist to the battle. The game is build in excellent 3D graphic with nice detail that players can distinguish each characters quite clearly. The backsound is also good and suit the game well. Though build in 3D, the characters moves are still fluid and free from lag as long as the memory of the device is still quite enough. The unlocked items are also interesting. What makes this game a little bit disappointing is the fact that it mimicks another fighting game that had been released before WWE quite similarly. Otherwise, WWE Immortals for android is a great and hilarious fighting game worth to try. It’s easier than ever to play Online Battles! Big E hits the game in a new Gold version rewarded for a new special Multiplayer Seasons! A special WrestleMania PPV Multiplayer Season! Early Access Character Packs if you can’t wait!